Fieldbus masters enable the distributed collection of process data and signals, even for distant machines or equipment. 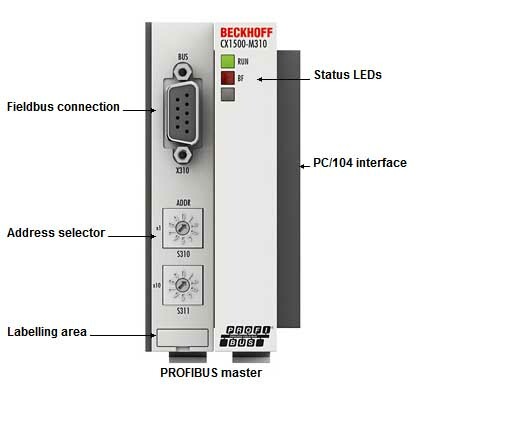 The use of fieldbus master modules in a CX1010/CX1020/CX1030 system enables the utilisation of all Beckhoff fieldbus components (e.g. Bus Coupler, Bus Terminal Controller, Drive Technology) as distributed control components for the assembly of complex systems. Parallel operation of several identical or different master connections is also possible, e.g. two PROFIBUS masters or one PROFIBUS master and one SERCOS interface master can exist simultaneously within the same system. Mixed operation of master and slave connections is also possible. A CX system can thus assume the functionality of an intelligent gateway between different fieldbuses, receiving data from a fieldbus, processing them via a program and then feeding them into another fieldbus. The performance data of the CX fieldbus master modules are nearly identical to those of the Beckhoff PC Fieldbus Cards, except for the fact that the CX variants are always single-channel types. The number of slaves that can be connected is only limited by the respective bus system. The use of master or slave connections enables networking of several CX systems with each other via the fieldbus level. In contrast to networking via Ethernet, strictly deterministic data transmission can be achieved in this case. CX fieldbus modules can be upgraded or exchanged in the field and can be connected to an existing CX system via the PC/104 system bus. The power supply of the fieldbus connections is also ensured via the PC/104 bus. The software integration of the fieldbus connections into the TwinCAT automation software is done in the usual comfortable way: scanning and detection of the modules, parameterisation, configuration of the connected I/O components as well as online diagnosis of the process and fieldbus status are carried out in the familiar way through the TwinCAT System Manager. Properties PROFIBUS – different DP cycle times are possible for each slave. The error management for each user is freely configurable.